Extraordinary Ministers of Holy Communion are adult parish members who are selected by the pastor, approved by the bishop, trained in their duties, and then installed in this ministry for a period of 3 years. With the approval of the pastor and the bishop, their appointments may be renewed in 3-year increments. 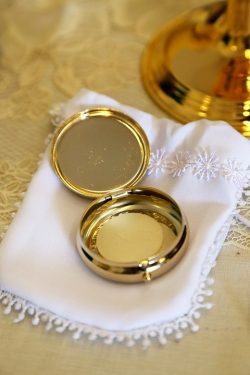 Typically, this ministry involves assisting in administering Holy Communion to the faithful who are in attendance at our parish Masses. For some*, it may also involve taking the Blessed Sacrament to people in medical facilities or private homes. *Those extraordinary ministers who will be bringing Holy Communion to people in hospitals, nursing homes, other residential facilities, and/or in private homes, must also complete a VIRTUS® awareness session and submit to a police background check. Adult parishioners discerning a call to this ministry may contact Michael Lee in the Faith Formation & Communications Office: 920.437.0651. Training and Orientation will be provided.